The image of the surgeon is synonymous with strength. Surgeons are stereotypically charismatic, commanding, confident, even arrogant. Strong minds, strong bodies, strong wills. Leaders, especially in the operating room; they even act that way in other healthcare teams and committees, even if it is not their official role. 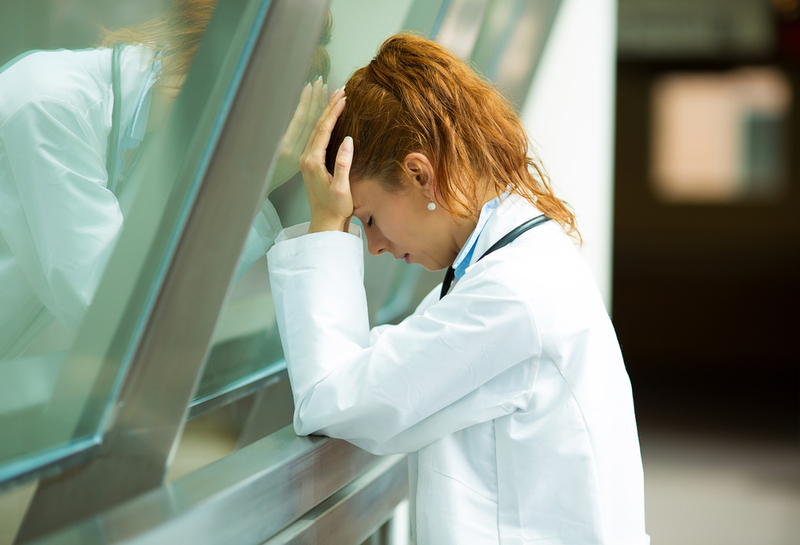 Surgeons endure long hours, grueling surgeries, all in addition to full office and clinic loads, and inpatient hospital census numbers on par with their non-surgical colleagues. It is intellectually, physically and emotionally challenging work. Surgeons seem to relish it, thrive on it. I had an epiphany at the end my fourth year of medical school, when we were in small group seminars dealing with aspects of life beyond graduation. I don’t even recall what that session was about. But I remember clearly that it struck me quite suddenly exactly how physical my chosen field of surgery really was. That, unlike my friends and classmates who were heading towards other fields, my ability to do my job as a surgeon was going to depend not just on my will and intellect, but on sheer physicality and functioning senses. But, what is a surgeon who doesn’t operate? I know that sounds like the setup for a clever punch line. But on the contrary, it is a question that cuts to the core of what it means to be a surgeon. Operating is not just what we do; it is part of who we are as surgeons. It is what sets us apart. A surgeon would say it is what elevates us. The physicality is apparent from the first introduction into the operating room. On the first day of my first clinical rotation in my third year of medical school, I assisted in my first surgery. We crowded around the OR table, the attending surgeon assisting the resident who operated, with me holding the retractors, the scene like a bizarre game of Twister. Our bodies wedged close as I tried to maintain the view while also trying avoid obstructing it or the manipulations of the operation itself. In other surgeries, students and residents were encouraged to step up, crowd in, reminded by our seniors that, “Surgery is a contact sport.” Physical indeed: Each person at the operating table, including the operating surgeon, is craning and contorting to maintain the view, and the position, so that the hands and instruments are in optimal position to dissect or suture. Laparoscopy hasn’t changed the contorting all that much: It is different, and it may even be worse. But the view is better. There is a joke about an internist, a general surgeon, and an orthopedic surgeon trying to catch the elevator as the doors are closing. The internist sticks out his hand, the general surgeon sticks out his foot, and the ortho sticks out his head. To this day, I use my foot to stop the elevator door from closing. That part of the story was no joke. Have to protect the hands. The injuries, illnesses, and accidents of daily life can have a huge impact on the ability to function and to perform in the operating room. A broken arm, an injured knee, even laryngitis. We are thankful that they are usually temporary. Looking back, I can’t believe that my orthopedic surgery attending let me pin the hand fracture for our head of trauma surgery, when he broke his hand skiing. I was thrilled to do the case, and thankfully didn’t think about what would happen if there were a slip of the driver or a wound infection. I did fine, he did well. I know another surgeon who did not fare so well, and had an infection after rotator-cuff surgery. His recovery was not so smooth: He could not return to the operating room, and he had to retire, his career ending early. Most surgeons have similar stories and experiences with colleagues like this. I have more. The job itself, and how we do it, also put us surgeons at risk. Risk of physical injury and illness. There is research being done on the mechanics of how surgery is performed, human factors engineering and ergonomics; the physical stresses surgeons endure. This is a relatively new field. Device manufacturers are paying attention, some better than others, and redesigning instruments. 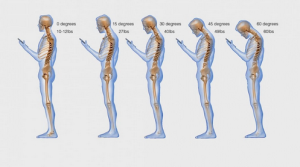 There is well-documented risk of neck/cervical disc issues, and problems with the upper extremities. 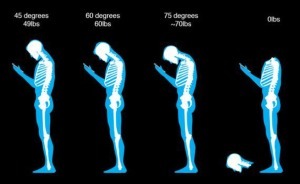 The recent graphic illustrating “text-neck” and its parody, could just as easily be illustrating the posture of surgeons at the OR table. Forces on the neck. Parody version. Women surgeons and gynecologists have been observed to have a significant increase in arthritis of the hands attributable to the design of laparoscopic instruments, the original designs based around the average glove size for men and not adaptable to the smaller hands of women. We are seeing these designs slowly change and improve. These are just two examples of many, of the wear and tear the actual performance of operations inflicts on the body, in ways that can actually end the ability to operate. There is risk to the surgeon from the exposure we have to the patients. Maximum exposure to all of their body fluids, since we maximally invade their bodies. These exposures can turn into infection with Hepatitis B and C virus, and less commonly HIV. The surgeon thusly infected no longer operates, so as to avoid exposing other patients. A surgical career ends. Long hours of standing in a stationary position also take their toll. I had my own health scare, sustaining a pulmonary embolism (blood clot to my lung), while writing my post op orders after a long day of surgery, at the end of a particularly grueling schedule (five weeks of every-other-night call, on top of a busy office practice and operative schedule). I survived, lucky to avoid a dramatic and abrupt end to my surgical career and life. I recovered, and am able to safely (both for myself and my patients) take care of patients and perform surgeries. But it was a wake-up call. It is a delicate balance the surgeon must strike to remain fit to operate, a balance shockingly easy to disrupt. It is bad enough that surgeons are so vulnerable to the risks of daily life, and life in medicine (this also a topic to explore further). But I think it literally adds insult to injury that the job itself can be the source of injury and impairment to surgeons. Surgeons are aware of and anticipate the effects of old age on their vigor, stamina, strength, vision, even fine coordination. They are prepared to reduce the scope of their practice to adjust. I would posit, however, that no surgeon expects the job itself, not just age, to be the mechanism by which their careers are truncated. I applaud the academic surgeons and their departments who undertake research in this area, ergonomics, and human factors engineering, risk and injury to the surgeon. Likewise, those in the industry who have begun to factor in similar research as they improve the design of our instruments and devices. But these groups are few, and small. This type of research needs to be expanded and funded. It needs to be part of the culture of all academic surgical departments, expanding in parallel to the growth and sophistication of simulation centers, making use of the simulation environment itself. All device and instrument manufacturers need to take this more seriously and move this forward as well. Government and regulatory agencies in place, like the FDA or OSHA, are well positioned to include this in their evaluations as new devices, techniques, and technologies are presented for approval. Experts indicate that we are facing a critical shortage of surgeons, especially general surgeons. We cannot expect our current and future generations of surgeons to fall on their swords, sacrificing their health and careers and their unique skills to the job that demands greatly of all three. We need to be able to shore up and support our fragile surgeons, so they are as physically strong as their image. We need to help surgeons continue their careers as surgeons.